Fall is a magical time of the year. The light is golden. The farmers’ fields are golden. The leaves change colors, to warmer and richer and even golden hues. There is something going on within us that cause us to adjust our rhythms and outlook. We might slow down a bit and probably become a bit more reflective, anticipating the greater changes that are on their way. If we are farmers though, we get busier. It’s harvest time. All of our efforts for the previous many months are about to be paid off. It might be a good return or perhaps not. But we will likely get something and for that we are thankful. We want to be secured against the cold and fruitless months ahead and to be rewarded for the work we have put in. We acknowledge this in what used to be called Harvest Thanksgiving. Now, the urbanites that we are will have mostly lost our connection to where this holiday originated. I grew up on a farm and loved the harvest Thanksgiving celebration. I loved how the church would be decorated with sheaves of grain and baskets of vegetables. Coloured leaves would grace the interior as well. What was typically an austere and almost penitent environment would be transformed into a festive display of the bounty of the fields and gardens. It was wonderful. I sometimes ask my design students what their crop would be, if we were to compare their work to that of farmers. What will they bring to market? What they produce is ideas. The analogy to farming isn’t actually so farfetched. Both are based on a process with many incremental steps. Designers prepare themselves in many ways for their eventual harvest. One may be the formal training they get in school. They learn how to use their minds in flexible and innovative ways. They learn the importance of preparation. They learn how to be analytical and reasonable when they need to be, and to be unreasonable and creative when they should be that as well. They learn how, like farmers, to direct their efforts at an eventual outcome. Beyond or instead of school, experience will also show them the way and reinforce their lessons. So what is the harvest Thanksgiving festival for designers? I can’t speak for many of my colleagues, but in the world of furniture design, there are trade shows that typically act as the catalyst and schedule for new design work to be committed to and finally presented. They are a big deal, in a lot of ways and the excitement that they generate is palpable. They are a chance to see and be seen, to feel proud and accomplished. They celebrate the health of an industry and the many players in it. Sometimes, I’ve wondered if they make as much financial sense as the huge budgets suggest, and I know I’m not alone in that curiosity. But we seem to do them regardless. It may be because the needs they service go beyond the strictly mercantile. Celebrations remain important to us. Other ways we celebrate our design ‘harvest’ is through media exposure and awards programs. The media features may be very ephemeral and the awards don’t usually translate into tangible increases in business, but they are a validation just the same. Producing something marketable, and taking it to market is a huge part of our professional, productive and economic lives. Our culture runs on this, despite the claims that we are now post-industrial, post-agricultural or in a new world altogether. We can’t just have services. We need goods as well and we always will. They need to be produced and taken to market. We can even say that collectively, our lives depend on it. Whereas agriculture was once the most important and vital activity that we engaged in, now we have others of major importance as well. I find it to be very gratifying that we, as designers, produce something. If we are the kind of designer that I am, our produce is products. These are based on the ideas we have generated, grown from those seeds, so to speak. They have been selected, nurtured, cultivated, weeded, fertilized and eventually harvested. While we may, within our various industries, celebrate our achievements, we lack a broader, public celebration of those accomplishments. Maybe, when we sit down to our turkey dinner, we ought to give thanks for all of the design efforts as well, along with our gratitude for the cranberries and mashed potatoes. 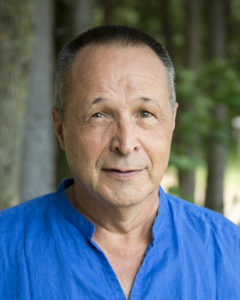 Paul Epp is an adjunct professor at OCAD University, Toronto, Ont., and former chair of its Industrial Design department.